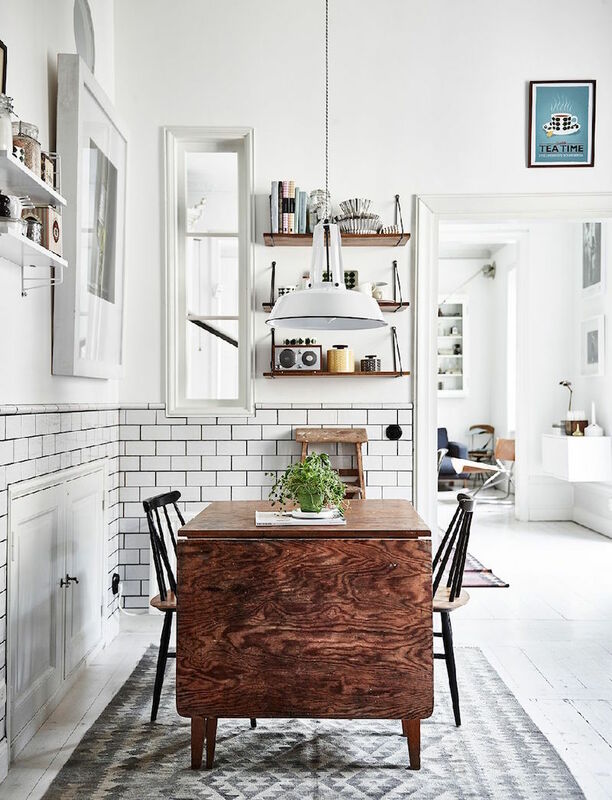 So, a daily irritation for me is that I spot a totally beautiful room on Pinterest or another blog, seek out the source so I can use it for a home tour post, and then find that either a) the rest of the home is awful, or b) there aren't any more photos. Over the last few years this has led to countless pictures that are PERFECT for this blog being tossed aside because they don't fit the 'whole-house-or-nothing' format that I've been using. I'm not sure why it's taken so long but I've finally thought of a very simple workaround for this problem, in the form of a new series: Friday Five! Every Friday (or as often as I remember) I'm going to do a little round up of individual rooms with really cool decorating ideas that you can nick to use in your own house. They'll be roughly grouped by theme or area of the house, but the idea is that the format is quite loose. Anyway, first up is dining rooms! Here are five really nice ones that I found over the course of this week. If you like this as a series then let me know and I'll do more of them! And if there's any particular room or feature that you'd like to see ideas for, leave a comment and I'll see what I can find. Next up I'm thinking kitchen shelving but I'm open to suggestions. The other day I was sat in a beer garden which had lights just like these strung up overhead as a sort of canopy. I pointed them out to Sam and said how nice they would look indoors, possibly strung around a fireplace or a doorway. I hadn't really considered that you could just recreate the EXACT same look indoors without it looking a bit... well, like a pub garden. I love this though. I reckon the trick here is to make sure that the bulbs are quite delicate. Outside you need massive ones because they're fighting against a sea of darkness (the sky) but if you put the same ones indoors they would dominate the room. Less is more. Via Design*Sponge. If you liked this then it's worth checking out the rest of the apartment on that link. I've called it a parquet floor, but if you look closely it's actually an imitation job. Apparently the owner is "allergic to varnished parquet" (really?) so he ripped up the old floor when he bought the apartment and did this instead. Seems like a waste - couldn't you just sand off the varnish and whitewash that? Still, this looks great too - I'm so impressed by how even the colour gradient is from square to square, and how clean the line is between each one. Ok fine, maybe putting this guy on the table was a bit mental - I quite like being able to chat to my dinner guests without straining my neck. But the plant does genuinely look really good in that enormous vase, and both of them work brilliantly with the colour of the chairs, flooring and tabletop. If you relegated it to a stand in the corner of the room you could have pretty much the same effect with some added practicality. Win-win! I love this so much! It seems to me that when people have conservatories they don't get used as much as they should. Putting your dining table in there pretty much guarantees that you're going to make use of this lovely, light room every single day. Granted, I probably wouldn't do this if all the walls were made of glass - eating in there during winter would be torture. But brick walls with big windows and a glass ceiling feels to me like the perfect environment for eating. This one is pretty casual as dining rooms go, but I really like the combo of wood, tile and shabby rug. The foldaway table is really cute too - perfect for day-to-day living as a couple, with the option of extra space when your mates come over. If you look at the full set of photos on the link below, this isn't actually the primary dining area - the owners have a full sized dinner table in the main living area and then this little one tucked away in the kitchen. Of the two I think like this one far more.